There are people who trying to find new ways to improve an existing technology and some of them come up with very exciting novelties. One Estonian start – up company called Velmenni found a new and faster way to deliver data over the air. Our traditional wi – fi delivers data using radio waves and Estonian company invented li – fi which offers 100 times faster speeds while using visible spectrum to deliver internet access. 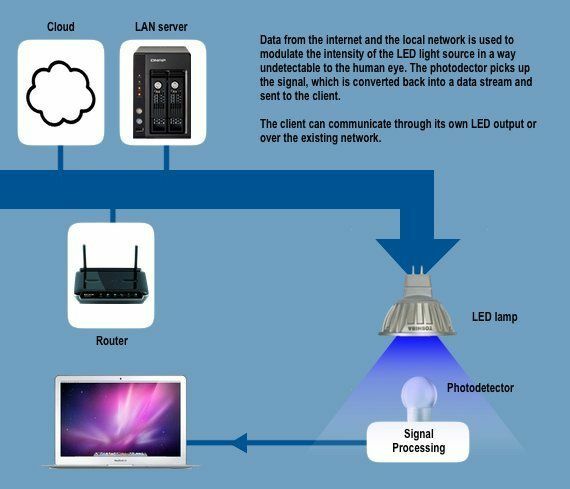 Li – Fi technology requires a light source, photo detector and of course internet connection. Please, take a look at this graphical image to understand better how this new technology is used in the office environment. Some people are speculating that this new technology will be available within the next couple of years. However, this new much faster technology than wi – fi has few disadvantages and it will take few more years to find the way to improve it for the general public. Since it requires the light to deliver and transmit data it cannot be used outside, because it would interfere with the direct sunlight. Also, li – fi signal does not travel through the walls and it can only be used in one office work space. It is amazing that this new technology can offer speeds that are up to 1GBps (gigabit per second). We are all impatiently waiting for li – fi to become a new part of our lives. Keywords: technology, Li – Fi data, computer repair in Deer Park, Cell Phone repair in Barington, computer repair in Barrington, apple repair in Barrington, iPhone repair in Barrington, Samsung repair in Barrington.